Clam City is the sixteenth level of Donkey Kong Country (fifteenth in Game Boy Advance version), and the sixth and final level of the Vine Valley area in the Super Nintendo Entertainment System version. It is also the fifth level of the Vine Valley area in the Game Boy Advance remake, having switched places with Temple Tempest. This level is the second underwater level in the game, but unlike Coral Capers, this one takes place in the sea (instead of a lakebed). 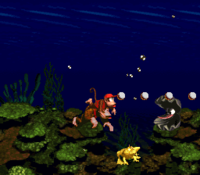 Donkey Kong and Diddy Kong are bound to meet various aquatic enemies such Clambos, Bitesizes, Chomps Jr., Chomps, and Croctopuses. But as the name of the level implies, Clambos are found everywhere in Clam City, shooting multiple pearls at the Kongs. Observing the Clambos' attack patterns is highly recommended to go through this level safely. Enguarde also appears in a secret area in the level. This is also the third level not to feature any Bonus Levels. 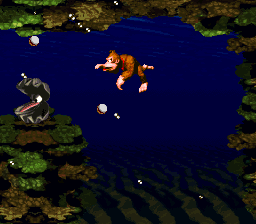 At the beginning of the level, the Kongs swim into an area that progressively becomes wider as they move forward. They can find a Clambo at the bottom corner of the area under a thin passage leading upwards. This passage takes them into another wide area, where the first DK Barrel in the level is located. Another passage leading to the south branches off of this area. As the heroes swim through it, they come past a Bitesize and a Clambo shooting pearls at them. A small channel under a coral wall is at the bottom of this passage. An area full of Bitesizes is on the other side of the passage, containing a small alcove with the letter O in it. After traveling into a slightly smaller area at the end of here, the Kongs come up to a Clambo, who shoots two pearls at once. Another passage is to the north of it. The passage becomes wider after the primates swim slightly higher, giving them more space to avoid the pearls of the many Clambos found throughout it. At the top of the wide passage, they can find a DK Barrel in a small alcove and another thin channel with a large area full of Chomps Jr. enemies after it. A passage at the other side of this area includes an alcove with the level's Star Barrel in it. A group of bananas forming into an arrow shape stand below the barrel. The Kongs approach a Clambo, which guards an Animal Token. The Kongs can find a wide pathway facing north ahead of here. A Clambo shoots pearls from the center of it. Another Clambo sits on a coral structure at the top of the area, shooting three pearls at once. Once the primates swim over it, they can find a pathway facing south, holding a lone Clambos in a small alcove. A smaller passage at the bottom of this area leads past a DK Barrel and into a wide passage leading to the north. As the Kongs progress through it, they come up to five Chomps enemies and then the letter N, located at the top of the area in a corner. A tight channel leading into another open area is to the right of here with another Clambo in it. The enemy, who guards an Animal Token of Winky the Frog, shoots several pearls at once. If the duo manages to dodge the pearl projectiles, they can access a section full of many Croctopuses. At this point, they can find a sign that indicates that the level is almost complete. Once they pass the octopus-like foes, they move through another short channel and enter a square-shaped area containing a Clambo on a coral structure with the letter G under it. An exit sign stands on the opposite side of the enemies, pointing to the exit. Once they swim into it, they gain access to the next level. K: After passing the first Clambo, the heroes head up a passage. They can find a hidden pathway through the wall to the left of the passage that leads them into an area with an Animal Crate containing Enguarde and the letter K.
O: Shortly after passing the first DK Barrel in the level, the heroes access a wide area full of Bitesizes. The letter O is at the top of this area in a small alcove. N: From the third DK Barrel, the Kongs head north through an area full of Chomps. The letter N is at the top of this area in a corner. G: The final Clambo in the level, found immediately before the exit, sits on a stationary structure. The letter G is under this structure in a narrow passage. The Kongs enter the area with the photograph. Shortly after the letter O, the Kongs begin to head north, approaching a Clambo found in an alcove to the left. They should maneuver around it to find a hidden area with a camera icon in it. If they collect this object, they earn a picture of a Clambo on the second page of their scrapbook. The Kongs meet the first Clambo in the level. The characters swim around several Bitesizes. The Kongs swim in an area full of Chomps Jrs. The Kongs approach the level's Star Barrel. Diddy next to the letter "K"
The characters are surrounded by several Chomps Jrs. Donkey Kong approaching the letter "G"
This page was last edited on April 9, 2019, at 18:24.